Our friends at Nextera Records in Prague licensed Space and Time for an Eastern European release. Everything is the same as the U.S. Edition except that the disc is a full-color print, and it includes some Czech contact information. For the completist! 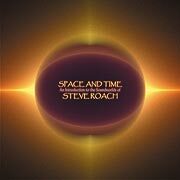 Space and Time offers an unique overview of the nearly 20 years of groundbreaking recordings from noted ambient pioneer Steve Roach. Excerpting tracks from his thirteen Projekt Records CDs, Roach hand-selected and mixed these pieces into a perfect flow which serves as an ideal insight into his vast recorded history.